Dean’s Chocolate Utility Coat is introduced the moment we are introduced to Dean. It’s very utilitarian, with its combination zipper-snaps and four large front pockets. 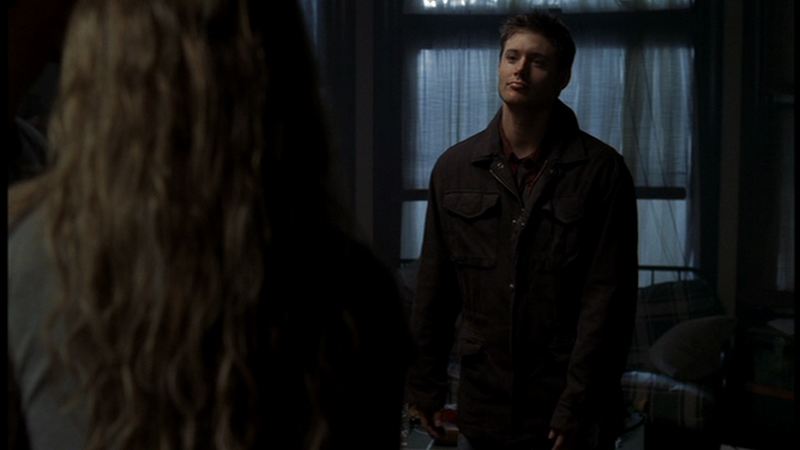 It sometimes looks like Dean's Black Utility Coat, but I'm 90% positive that the two are different. Nothing to say about the coat, but i love the picture that you choose. The pout is cute! Just a bit of info on this coat, Dean doesn't change out of it, it just magically disappears lol. He's wearing it when he jumps off the bridge, but in the next scene where he's leaning against the car covered in mud, it's actually a different jacket, it's the same black Alpha Industries M-65 that he wears often on the show. Also, you know the brand of his black utility coat?!?! Awesome! I'll include that too! Let me know if you know thee brands of any of their other clothing - I like to include that info when I can find it. I know the brands of almost all of their clothing lol. I collect the clothes they wear, mainly Deans, I've got a few of his shirts and jackets. There's only a few things left that I haven't been able to identify. If you want to send me a message I'd be more than happy to help you out with the brands. Awesome! Um, send you a message where? (Forgive the non-tech-savvy person.) Unfortunately right now, I don't have reliable internet access (I'm at work at the moment)...but yeah, I'd love to know the jackets at least. I've been able to figure out some of Dean's shirts and t-shirts too. But I only really know the brand of Dean's leather jacket and Sam's "Superhero" hoodie-jacket. I copied down your email address, so you can delete the message now! Thanks! Hopefully, I'll get my internet at home hooked up soon. I just moved, and the internet hook-up guys screwed up.